Summary: With the Big City Slider Station you can cook the perfect mini burgers for the next big game in just 2 quick minutes. Meal time or snack time, every time’s the right time for sliders! 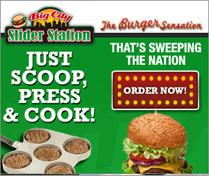 With the Big City Slider Station you can cook the perfect mini burgers for the next big game in just 2 quick minutes. Parents love how fast the Big City Slider Station puts lunch on the table. Clean up is easy, and kids love mini burgers!